Have you thought about or made any changes in your life this week as a result of the sermon? In what ways are we influenced by the people around us? How have your thoughts, beliefs or actions been influenced by people in your life? When has living in community with others been a blessing to you? 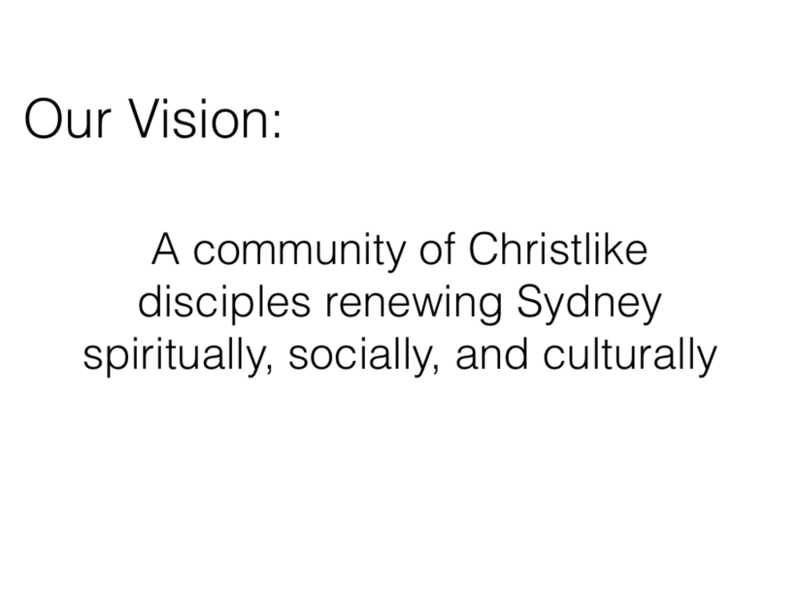 What is Jesus’ vision for community in his prayer? What does ‘being one’ mean when it comes to differences of opinions or different ways of doing things? Do we all need to be the same? What about the things we believe as Christians? What things make it difficult for you to live in peaceful community? 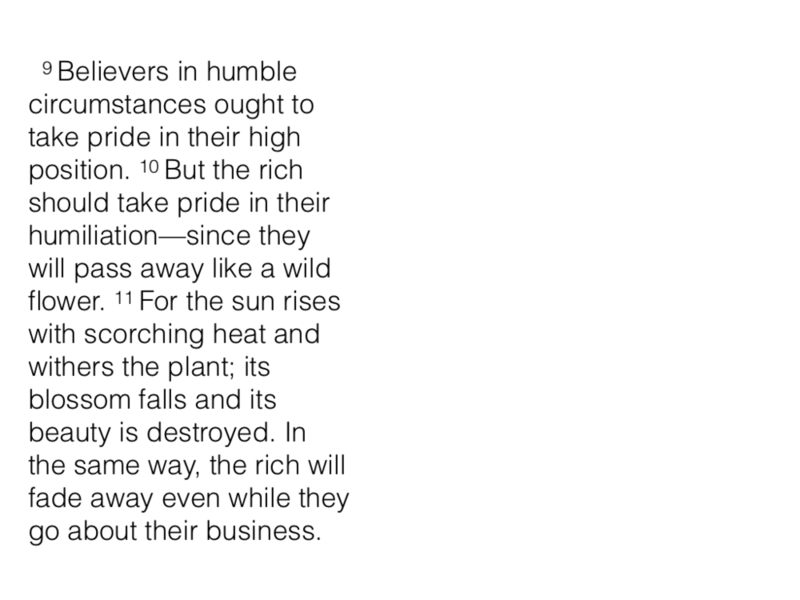 James 4:7-10 says that humility is the key to removing pride from our lives. What is the difference between being humble and being a walkover? In his sermon Mark said that low self-esteem is a form of pride. What do you think of that idea? In what ways is it true (or not)? How can we help ourselves and others deal with spiritual pride? When have you seen conflict resolved, or peace achieved, through the humility of an individual? How could knowing you are totally and completely loved by God bring more humility into your life? Are there any relationships in your life where you need to be the peacemaker? Discuss this with your group, as you are comfortable. Pray about it, asking God to guide and support you. Ask your group to help you come up with a plan of action, including asking them to follow up about it later with you. Pride makes you more aware of others faults than you are of your own. Pride leads you to have air of contempt and disdain of others when speaking of their faults. Pride leads you to quickly separate from people who you’ve criticised or who criticise you. A proud person is dogmatic and sure about every point of belief. A proud person loves to confront because they like winning. Thinking about all aspects of life - history, society, culture, relationships etc – in what ways are words powerful? When can we use ‘speaking the truth’ in an unloving way? When can our fear of conflict or our desire to be liked stop us from speaking the truth? How do we effectively speak the truth in love? Why can’t our words be controlled by the application of good advice or will power? What is the truth spoken about us as Jesus went to the cross? Do you find it easy to listen to others? Why or why not? How do you feel when you are not being listened to? When in your life have you felt encouraged by being listened to? What has being slow to speak got to do with being slow to become angry? 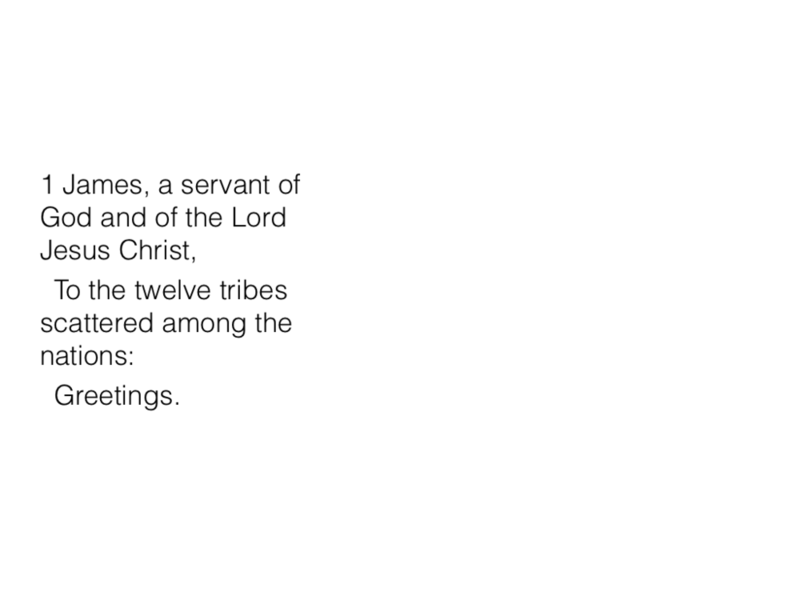 The “word” in verse 21 refers to God’s communication through the bible and through the incarnation of Jesus. Being 21st century Sydney-dwellers, what parts of the word do we as a culture find easy to accept? What parts of the word do we find difficult? Do you think the church is disproportionally concerned about some parts of the word, and not concerned about enough about others? What parts of the word do you find particularly challenging? Verse 25 describes the word as ‘the perfect law that gives freedom’. How can law give freedom? In what ways does your understanding of God’s love for you influence how easy or hard it is to accept that obedience to God’s word leads to freedom? If the freedom that James is talking about is the freedom to live as we truly are – to flourish as our true selves – what would that freedom look like in you? Words have the power to build up and also to tear down and destroy. In this exercise we will form words that will build up. You will need a pen, paper and envelope for each member of the group. Each person write a letter of encouragement to themselves. 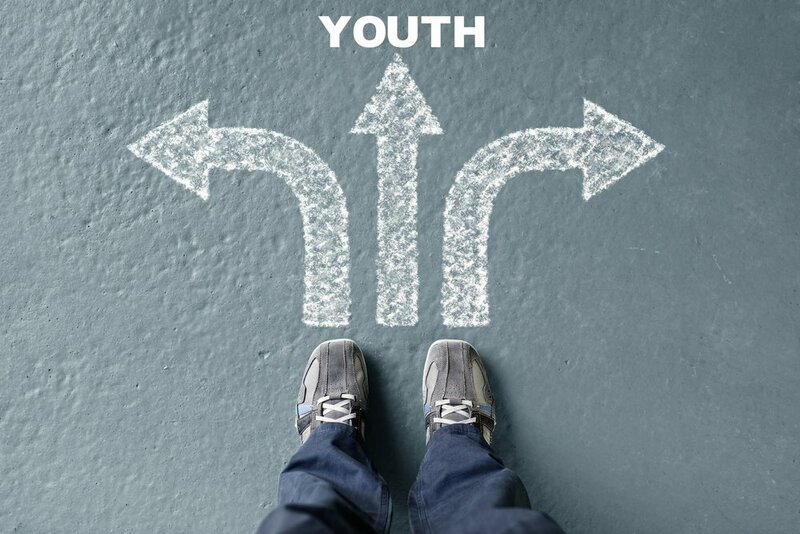 Be conscious of the power of the words you choose and write with the aim of encouraging yourself toward freedom and spiritual maturity. You may like to include a bible verse or other words you think God is speaking to you. Place the letter in an envelope, seal it and address it to yourself. Then give it to the group leader. Group leader – hang on to the letters and post them in 6 months time. Did anything surprise or challenge you? Has the question ‘why does bad stuff happen to good people?’ been one that has been a struggle in your journey of faith? 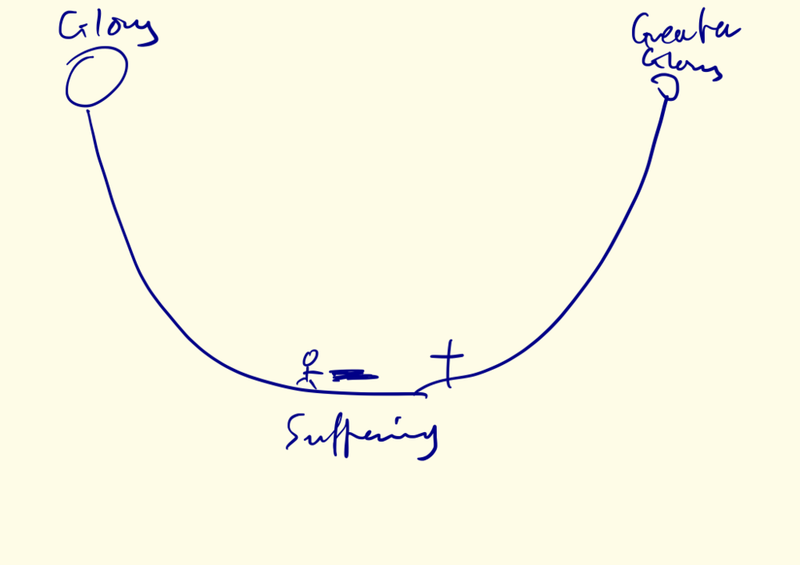 How do we, as a society, fail to prepare us for the inevitability of suffering? Mark spoke about two ways to suffer - suffering that leads to bitterness and death verses suffering that leads to joy and life. Where have you seen suffering lead to bitterness and death? Where have you seen suffering lead to joy and life? Is facing trials with joy the same as facing trials with happiness or good feelings? 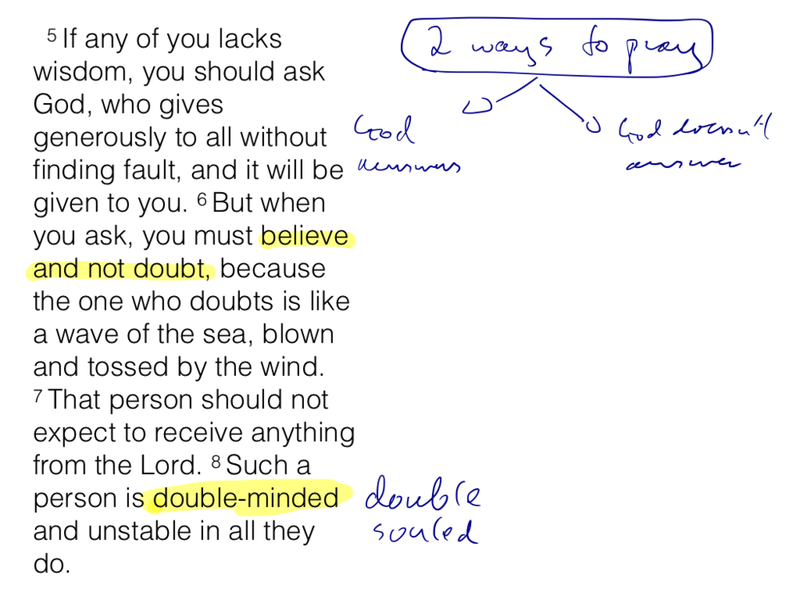 What is James’ logic in verses 2 – 4? In what way is suffering a testing of our faith? Does James’ logic make sense to you and to your experience of suffering? Think back to a time where you went through a time of suffering that resulted in you growing spiritually. What helped you grow during that time? Verse 6 says that when we ask for wisdom we should not doubt. ‘Doubt’ in this context is not about the psychological certainty of knowing that God will answer our prayer, but rather it is about where you put your trust. What things other than God could we trust in times of suffering? Is this saying we should not have operations, buy insurances, save money etc? ·When you have experienced suffering in the past, has anyone close to you been able to say they truly understand what you are going through? Did you find this helpful? Does it help you to know that Jesus has persevered through suffering? If yes, in what way? If no, why do you think this is? Spend some time praying in solidarity with members of your group who are currently suffering, or spend some time in prayer focusing on Jesus’ perseverance through suffering for your sake.